Portion Size: 1 whole sandwich - 4"
Build sandwiches. Open and lay out rolls. Place ¼ c. green leaf lettuce on the bottom of each roll. Top with 2-3 slices tomato. For each sandwich, fold meat and stack 2 slices turkey ham, 2 slices turkey salami, and 1 slice turkey bologna. Finish with 1 slice cheese and then top of bun. Hold at 41°F until serving. Hoagie roll, whole grain, 6"
Cheese, mozzarella, sliced, .5 oz. 1 serving provides 2 oz. meat/meat alternate, 2 servings bread/grain, and ¼ cup vegetable (other). 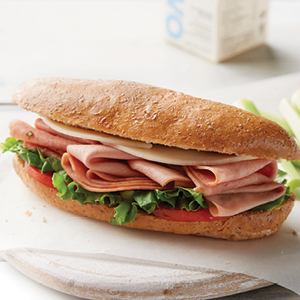 Hoagie roll, whole grain, 6" 50 ea. 100 ea. Green leaf lettuce 2 lbs. 4 lbs. Tomatoes, fresh, sliced, 1/8" 3 lbs. 6 lbs. All Natural Sliced Uncured Turkey Ham, #2568-18, thawed 3 lbs. 2 oz. 6 lbs. 4 oz. All Natural Lower Sodium Sliced Turkey Salami (non-MST), #2631-18, thawed 3 lbs. 2 oz. 6 lbs. 4 oz. All Natural Lower Sodium Sliced Turkey Bologna (non-MST), #2630-18, thawed 1 lb. 9 oz. 3 lbs. 2 oz. Cheese, mozzarella, sliced, .5 oz. 1 lb. 9 oz. 3 lbs. 2 oz.